Wish you had a magic crystal ball that would give you access to all the elusive customer information you've been seeking? In order to sell their products, goods or services, businesses need to know their target market. More specifically, they need to know what it is their customer is looking for and come up with a way to meet that need (and the fact that they can meet that need). Datamine has decades of collective experience diving into customer data to deliver organisations the insights they require to improve their customer targeting and drive business growth. Our clients often come to us asking the following questions - our team of experts sat down and compiled the following answers, giving you everything you need to know about customer insight. Use the Contents list to the right to skip to a particular question, or download the page as a PDF using the button below to read later! 1. How do I get deeper insight into my customer base? 2. How do I ensure a great customer experience? 3. How do I stop my customers from churning? 4. How do I maintain customer loyalty? 5. What discounts should I offer my customers? 6. How can I get a broader view of customer behaviour? 7. How can I predict customer behaviour? Curious about customer insight but don't have the time to read all this right now? No problem - use the form below to download this page as a PDF for later. 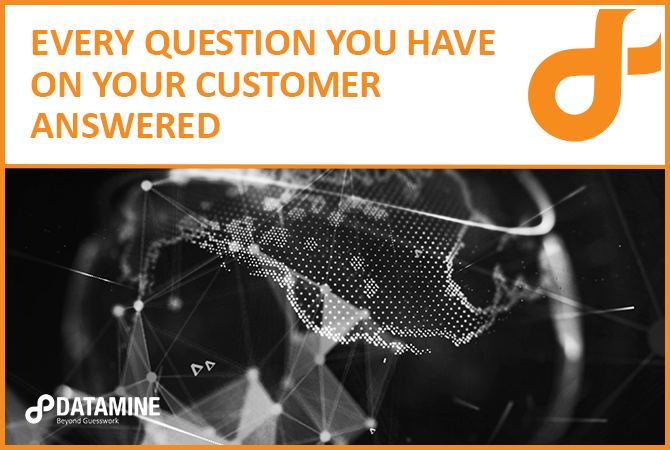 You won’t be surprised to hear that this is one of the most common business challenges we encounter at Datamine, and that the vast majority of the analytics solutions we offer are ultimately designed to help clients better understand their customers. Customer insight analytics are no longer a novelty expenditure – understanding your consumers’ needs and wants is imperative to keeping your organisation afloat in the ever-tumultuous waters of today’s market. To begin, what is customer insight? Customer insight is more than just knowing the average age, gender or location of your customers, or whether or not they enjoy doing business with you. Yes, this surface-level view is all a part of it, but analytical customer insight dives much deeper. It comes from combining a variety of different data sources (see fig. 1) to paint a rounded picture of the thousands or millions of people that make your business tick. 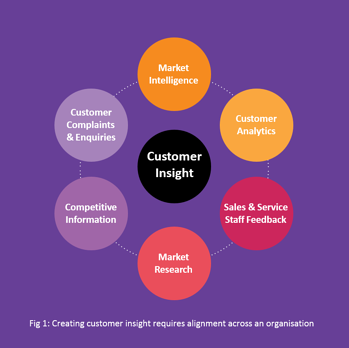 When done correctly, any kind of customer insight analysis should be actionable enough to affect change throughout your organisation. It should ultimately drive your company’s philosophy and decision-making process from top to bottom, giving the business the direction it needs to thrive and be customer-centric. So how do I get those customer insights? - What’s the goal of this organisation? - What data do we have? - What do we already know about our customers? There are dozens of other questions you’ll need to consider before embarking on the initiative, many of which will be specific to your business, customers and data available and will arise during your initial team conversations. Once you’ve created a framework and know what you’re trying to achieve, it also makes sense to consider any tools, such as statistical analysis applications, databases and visualisation solutions that can assist in your analytics endeavours. These are just a few of the many different ways businesses can gain invaluable customer insights through analytics. Getting deeper insight into your customer base is not a one-stop process – it’s an ongoing journey to understand your customer that requires philosophical alignment within the business and a dedication to implementing data-driven insights. And the analytics solutions listed above are the first step on that journey. Interested in reading more about how analytics can help you better understand your customer? 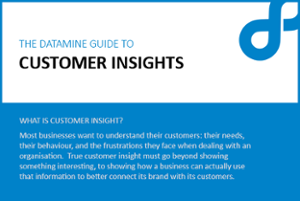 Download the Datamine Guide to Customer Insights for free here. One bad Yelp review can rot the whole barrel. Reviewing a business online is easier than ever – it takes two minutes or less to log on, write up a comment, click a number of stars and press Enter. This kind of easy review can be either instrumental or detrimental to companies, depending on how people feel about their experience. Despite the ease with which a customer can obliterate an organisation’s reputation online, customer service is still seen as relatively insignificant by many businesses. In fact, according to research from SuperOffice (U.S.), only 48% of companies respond to customer service emails! If you’re reading this, though, your business is clearly interested in delivering the best possible customer experience – as you should be. But how? These are all practical approaches to ensuring a great surface-level customer experience. However, a great deal of customer satisfaction comes not only from the in-store or service experience, but from the marketing leading up to the moment of purchase. And this is much harder to perfect and measure. In order to truly ensure a consistently good experience to your wide range of different customers, you’ll need to dive into the customer data – both to deliver that experience through your initial marketing and to measure its success. 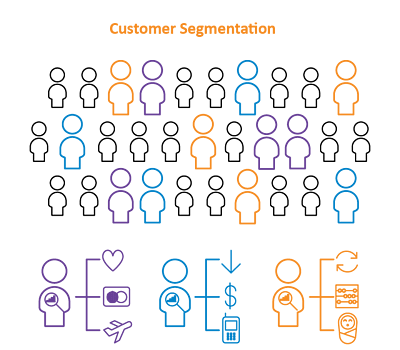 There are a number of different analytics projects that can bring you these insights, but the most common one is customer segmentation. Segmenting your customer base (whether by age, location, gender, buying patterns etc.) is a great way to determine who is looking to get what out of your business. Everyone has different reasons for spending money at a company, and it’s important to differentiate your marketing between individual customers in order to deliver them the experience they’re looking for. Within these segments of very differently driven customers, you’ll have to throw in the variations caused by age, location, marital status etc. Segments can quickly hit double digits! Now imagine trying to use a blanket approach to ensure all these customers want to do business with you. Hint: it won’t work. If you show an ad or send out an email to all the segments depicting a man proposing to his partner with one of your engagement rings, it will be irrelevant for the majority of your customer base. However, if you segment your customers into similar groups, you can create personalised marketing messages and experiences for each of them. This enables better targeted marketing spend and will show your customers that you’re paying attention to their buying habits – you know what they want, and you’re not going to spam them with promotions and ads that aren’t relevant to them. *And don’t put people on hold for over ten minutes. So you’ve worked hard - you’ve done your research, marketed well, gone out and acquired a ton of customers. This is a massive achievement! It doesn’t mean, though, that if you now sit back and relax for a few years, your customers will happily continue buying from you. Customer churn is real. It’s an unavoidable plague upon all kinds of businesses, and it can cause anyone’s downfall if not properly attended to. So what can organisations do to lower their customer churn? 4. Find your competitors’ weakness and use it to your advantage: Or if you don’t feel like throwing shade, find your unique selling point, the thing that sets your product or service apart from everyone else’s, and really highlight it. If one of your customers was considering leaving your business, what is the thing about your business/product that might make them stop and decide to stay? Considering and actioning the above suggestions is a good starting point for businesses that want to lower churn. The next step along the path - the one that will really move the needle on your churn rates - is to dive into customer data to identify potential churners before they’ve actually cut the cord. Particularly in naturally high-churn industries like Retail and FMCG, this analysis is necessary to implementing preventative measures and lowering churn on a large scale. The solution we tend to suggest for our clients in these industries is known as slider modelling - it’s an approach that looks at transactional history to identify customers that are sliding (meaning they’re close to churning). Determining who these customers are before they have actually stopped buying your product or service allows the marketing or sales team to step in and find a way to bring them back into the fold. But my business and customers are unique - how do I do this? Naturally, everyone’s buying patterns look different. Some people might shop at your store every couple of days, spending a fairly small amount. Others might shop sporadically and spend large amounts. By creating a model that uses previous data outlining purchase patterns and whether or not they led to churn, then running your current data through that model, you can pinpoint any customers that fit the mould of a potential churner. The short answer to the original question is this: You can’t completely stop your customers from churning. There will always be people who will choose to leave for reasons out of your control. However, there are best practices you can implement to increase customer satisfaction with your brand, as well as preventative measures you can employ in order to catch churners before they’re gone. Similarly to the above section on churn, customer loyalty is a difficult challenge that many organisations struggle to quantify. If you run a smaller business, chances are you’ll see repeat customers and can gauge loyalty simply on the number of returning patrons you have over time. However, the bigger your business is, the more challenging it becomes to judge whether or not your brand and service are good enough to build a loyal group of customers. What are some ways to make customers loyal? Well, many of them are similar to the descriptions above for reducing churn. You need to facilitate a great customer experience and offer people what they actually want. Be transparent and up-to-date and friendly - make sure doing business with you is easy and relaxing. If you have a small business, try to remember people by name. If you have a larger business, look into personalising marketing communications so people still feel like they matter. And one of the best ways to ensure customer devotion to your brand is by implementing a loyalty programme. Organisations with a loyalty programme are often unsure of the value it is actually adding - it can seem like a waste of marketing expenditure if the benefits are hard to see. The only way to actually measure the efficacy of your programme is to analyse the way it has affected customer buying behaviour and overall revenue. Such an analysis gives businesses insight into what the value of their loyalty programme is, what might happen if they changed it and ways they can optimise it. Ask a retailer or an FMCG organisation what the best way to get customers in the door is, and they’ll likely say the same thing: offering discounts or promotions. The goal of these special deals is to bring in an influx of sales - not only for those discounted items, but for products across the business. Unfortunately, finding this sweet spot can be quite difficult. Many companies discount items that don’t end up promoting other spend, meaning they’re potentially losing money while the customer walks away with a basket full of half-price items. - Discounts on unwanted stock - depending on your business, you should discount things like last season’s clothes, muffins at the end of the day, older models of certain technologies etc. - Free shipping or free returns - customers will pay full price for the item, and you’ll pay for the shipping. For some reason, people seem to love free shipping - even if they end up paying a bit more for the product itself! While these are all great general strategies for offering discounts, the only way to determine the best discount strategy for your business (particularly in the Retail and FMCG industries) is to determine your products’ individual price elasticities. This is defined as the relationship between price and demand - your ideal products to discount are those with high demand and a low price, or medium/low demand and a high price. Check out this price elasticity article for deeper insight into this concept. Analysing the data from past promotional campaigns can help shed insight into this, allowing you to deliver more targeted discount strategies going forward and ultimately increase revenue. It’s tempting to want to observe your customers along their buying journey, isn’t it? See what they’re picking up, putting down, what deals they’re looking at and what products/services they avoid (depending on the nature of your business, take this as literally or figuratively as you wish). This qualitative information would be incredibly useful, but it’s impossible to get at scale. Luckily, transactional data is not. Ultimately, your customers vote with their wallets - analysing their buying patterns can give you a picture of what they like and don’t like about your offerings. Chances are, your business has already begun (at least to some extent) delving into customer spend data looking for insights - insights that will inform your business decisions moving forward. Sometimes, though, the customer information within your databases isn’t enough to give you the truly deep understanding of them that you need to affect real change. Aggregated banking data: Through combining internal company information with high-level banking data (not individual transactions/profiles), businesses can better understand their market share. Such data is great for producing robust BI reports and an even deeper spend analysis. Mobile Location data: We've found that Telco data is useful in that it gives businesses a general sense for how people (as a whole, again on an aggregated level) move around in any given area - this is particularly valuable for advertising companies that want to know what kind of and how many people drive by a specific billboard each day. Census information: Census data can give organisations greater knowledge of their customer demographics. Some businesses only collect certain customer information and are in need of more understanding about their target customer - Census data can help fill in the gaps. These are just three of the many data sources that can provide an extra layer of visibility into customer demographics and behaviours. Through data commercialisation, companies can buy access to external data that will give them an even better understanding of their customers and business as a whole. Spend data, as described above, can show you (with relative clarity) how your customers have behaved in the past - what they’ve purchased, when, where and along with what else. The key to really maximising revenue and minimising waste, though, is to be able to use past transactional data to determine future output and sales. So how do I forecast customer spend? As mentioned previously, this methodology doesn’t come without its risks - self-calculated forecasts tend to be imprecise for a few reasons. To begin, you’ve only determined and measured a few factors - there might be many more you haven’t considered. Beyond that, you’re only looking at a couple variables at a time and not fully taking into account the possible interactions between them. Finally, and most importantly, your original data may not be as accurate as you assume it to be. Is the data spread across multiple databases? Are there anomalies that could be impacting the calculations? The moment your data becomes too big or complex for the above methodology, you run the risk of either over or under-producing and thereby impacting your bottom line. This is when a forecasting application or statistical model can come in handy. What forecasting tools are available? As you might imagine, there are many options to choose from, depending on the size and nature of your business. Many smaller companies use easier, less expensive tools to do their simple forecasting - these options are great for organisations that don’t have massive forecasting needs or a tonne of data to sift through, though they don’t scale well if the organisation has ambitions of grandeur. On the other side of the coin, there are a number of enterprise-level applications available on the market for larger businesses. You’ve probably heard of tools like Oracle and SAS - hugely scalable tools with an impressive amount of configurability, perfect for large corporations or businesses with enormous amounts of customer spend to sift through. They can, though, be a bit too complex and expensive for some businesses. If that’s the case for you, check out Datamine’s fit-for-purpose forecasting tool WeekAhead, made for businesses that fall somewhere between these two extremes. Our suggestion for getting started with forecasting is to begin with trying it out yourself - use the steps above to give it a shot, and if you find that you need a bit more structure, pop your data into a simple Excel tool. If those methods still aren’t giving you the results you desire, book a consultation with some forecasting application providers (like SAS or Oracle) and explain what you’re trying to achieve and what your limitations are. From there, you’ll have a better idea of the type of tool you’ll need in order to best predict future customer spend behaviour, and thereby sales. For more information about business forecasting or how WeekAhead could help streamline it for your organisation, fill out this business challenge questionnaire to schedule a free phone consultation with one of our expert consultants. Gaining insight into your customer base goes hand-in-hand with data analysis. Trying to make the move to a customer-centric business model but not sure where to start? Download the Datamine Guide to Customer Insights to the left. Check out the business challenge questionnaire below that outlines some of the common issues we help our clients work through, and get in touch with us if you’re ready to go beyond guesswork.